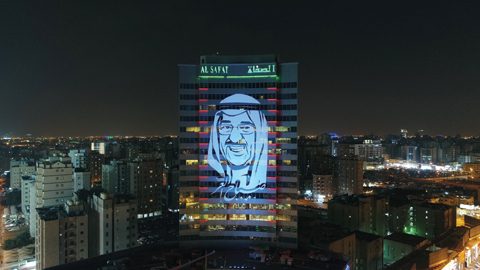 On the occasion of celebrating Kuwait’s national and liberation anniversaries, Al-Safat Investment Company decorated the front façade of its headquarters’ building with the world’s largest poster of HH the Amir Sheikh Sabah Al-Ahmad Al-Jaber Al-Sabah. A press release issued by Safat said that the poster’s artistic work and design took over two weeks of constant work, starting with the idea and followed by designing, execution and installation. The poster covers 936 square meters of the frontage of Safat Tower in Hawally, which overlooks three main roads: Fahaheel, Cairo and Beirut. Chairman Abdullah Hamad Al-Terkait said raising HH the Amir’s photo on the tower represents the group’s appreciation of his role in various economic, cultural and political arenas. Terkait expressed appreciation for the constant development Kuwait has witnessed under HH the Amir and for his vision on achieving economic development and moving towards turning Kuwait into a financial and economic hub. Terkait highlighted that a lot of development of Kuwait’s economic structure had taken place hand in hand with targeted development in the form of establishing the Capital Markets Authority to attract more investments, establishing the Kuwait Direct Investment Promotion Authority to attract more funds and economic expertise and establishing the SME Fund, in addition to privatizing the Kuwait Stock Exchange and establishing the Boursa Kuwait company. In terms of culture, Terkait said Kuwait has witnessed unprecedented cultural openness with full support from HH the Amir and through building various cultural edifices such as AlShaheed Park, Jaber Al-Ahmad Cultural Center and Abdullah Al-Salem Cultural Center – an international museum displaying scientific achievements and various nations’ histories. Politically speaking, Terkait said HH the Amir played a significant role in containing regional challenges, thanks to his wise leadership and emphasis on GCC solidarity. He also reviewed a number of Kuwait’s bright stances such as hosting an international conference of donors for Syria, all the way to the recently-held Iraq reconstruction conference. “This makes him a real Amir of humanity and a foreign policy sage,” he said. Terkait added the poster will be assessed by the Guinness World Records as the largest in the world to link it to Kuwait, which has witnessed various positive developments guided by HH the Amir. Terkait said as a Kuwaiti firm, Al-Safat Investment Company is keen on taking part in national anniversaries through a number of activities. Terkait also noted that Al-Safat is a leading company investing according to Islamic sharia, established in 1983. He added Al-Safat has wide-ranging investments and interests in real-estate, finance and other sectors; in addition, it offers a diverse set of financial and consultancy services that support shareholders’ aims and goals including portfolio management, special wealth and asset management and funding and market studies. He noted that Al-Safat focuses on hiring citizens within a comprehensive strategy that will positively affect the company’s performance and protect shareholders’ rights.